Remittances to India declined by 8.9 percent in 2016, to $62.7 billion, ranking the country as the top recipient of such inflows. In Bangladesh, remittances declined by an estimated 11.1 percent in 2016. In Pakistan, the 12 percent growth witnessed in 2015 moderated to an estimated 2.8 percent in 2016. 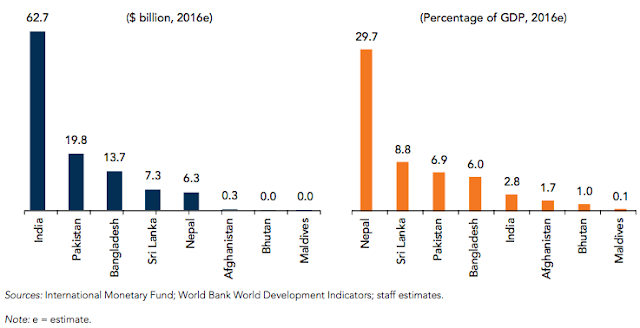 Nepal experienced unusually high growth in remittances, at 14.3 percent in 2015, due to emigrants sending financial assistance after the earthquake. In 2016, remittance flows to Nepal declined by an estimated 6.7 percent from the previous year’s high level. In Sri Lanka, remittance growth was estimated at 3.9 percent in 2016. The World Bank says the remittance growth in the region is projected to remain muted, because of low growth and fiscal consolidation in GCC countries with low energy prices. An increase of only 2.0 percent is expected in 2017. Bangladesh’s remittance growth in 2017 is forecast at 2.4 percent, India’s at 1.9 percent, Pakistan’s at 1.4 percent, and Sri Lanka’s at 1.3 percent. World Bank report says Pakistani diaspora bucked the 2016 global decline in remittances with a modest 2.8% increase over 2015. An estimated $19.8 billion remitted to Pakistan amounted to 6.9% of the country's GDP. This is a welcome relief coming on the heels of the State Bank of Pakistan report indicating the country's current account deficit widened to $6.13 billion or 2.6% of GDP in the first 9 months of fiscal 2017. Future growth in remittances is likely to remain muted. Slowing growth in such inflows will further increase pressure on Pakistan to work on enhancing exports and attracting more foreign direct investment. Is this my imagination or these figures are for South Asia only? Amjad: " Is this my imagination or these figures are for South Asia only? There are many other countries with foreign remittances like Mexico, Philippines and China"
My post focuses mainly on South Asia. Globally, India is the biggest recipient of remittances followed by China (2) , Philippines(3) , Mexico(4) and Pakistan (5). China has provided Pakistan with over $1bn in bailout loans since June last year, as the south Asian country looks to stave off a foreign currency crisis that could yet lead to another multinational rescue package. State-backed Chinese banks have come to Pakistan’s rescue on two separate occasions, officials have told the Financial Times, with $900m coming in 2016, followed by another $300m in the first three months of this year. The loans demonstrate the perilous fragility of Pakistan’s stocks of foreign currency, which have been depleted in the past few months as imports have risen while both exports and inbound remittances from Pakistanis abroad have fallen. China’s financial help also underlines the increasingly close, if complex, relationship between the two Asian neighbours. In 2013, Pakistan secured a $6.6bn loan from the International Monetary Fund after being faced with a similar balance of payments crisis. In the same year, it quietly took advantage of a currency swap line with the People’s Bank of China, the central bank, to shore up its reserves. Islamabad made the final repayment on the IMF loan last year, prompting optimism from policymakers in Pakistan and abroad that the country was finally on the path to economic stability. Christine Lagarde, the head of the IMF, called it a “moment of opportunity” for the country. In recent months however, the country’s trade deficit has widened, depleting its foreign reserves once more. Figures from the State Bank of Pakistan show the country had $17.1bn of net reserves at the end of February, down from $18.9bn at the end of October and a peak of $25bn several years ago. A burgeoning trade deficit with China — which has doubled in recent years, according to data from the Pakistan Business Council — is a big part of the problem. This has forced the country to seek emergency loans from outside sources to keep being able to repay older loans made in foreign currencies. Of the $1.2bn from the Chinese institutions, $600m came from the government-run China Development Bank and another $600m from the state-owned Industrial and Commercial Bank of China, the only mainland bank to have a branch in Pakistan. Policy banks such as CDB often act on behalf of the central bank. The recent deterioration is expected to continue, however, with China’s investment plans prompting a surge of imports from that country. As a result, experts are now warning Pakistan is likely to have to return to international institutions such as the IMF for further support. “Technically speaking we should have gone back to the IMF in January, but ministers are likely to try and wait until after the election [which is planned for 2018],” said Vaqar Ahmed, deputy executive director of the Islamabad-based Sustainable Development Policy Institute. One member of the ruling PML-N party confirmed to the Financial Times that ministers were loath to return to the IMF until after the election in an effort to limit the political fallout. “The IMF is a politically volatile issue in our country. If we go to the IMF to deal with our needs, that will send a very negative political signal and the opposition [parties] will use that against the government,” the person said. Not good. Why did it come to this? Ahmad: "Not good. Why did it come to this?" It was generally expected that Pakistan's imports would significantly rise with progress on CPEC projects. What was not expected is the huge drop in exports. In fact, the Pakistan government set an ambitious $35 billion exports target for current year, up from $24 billion last year. In reality, Pakistan's exports have tumbled to $15 billion in the first 9 months due to softness in export markets and increased competition from cheaper garment exports from Bangladesh. Pakistan needs to diversify its exports from textiles and garments to more higher value goods to remain competitive. Hopefully, with Chinese labor getting relatively more expensive, Pakistan will get FDI from China to build some more products in CPEC export zones being set up in Pakistan. Meanwhile, Pakistan will need to be bailed out by the Chinese to maintain its dollar reserves at a reasonable level with growing imports. 5% growth is decent, but at Pakistan's level of development it should be doing 7-8%. I think we will get a clearer picture of the society and economy once the census is completed, and next year GDP should be rebased for the first time in about 15 years. I would not be surprised if rebasing shows the GDP is 20% larger than currently reported. Given the facts on the ground (rising consumption and stock prices and corporate profits), I think GDP growth has been running faster than the current statistics are showing. Pakistan being an agricultural based economy can't expect to have high GDP growth. Manufacturing based economies like china and services based economies like Singapore can expect high GDP growth. Pakistan needs to focus on manufacturing as for services companies won't invest due to prevailing security scenario. Anon: "Pakistan being an agricultural based economy can't expect to have high GDP growth. Manufacturing based economies like china and services based economies like Singapore can expect high GDP growth." Agriculture output in Pakistan accounts for only 20% of GDP while services account for 55% and manufacturing 25%. The problem is that Pakistan, like many other countries, does not accurately account for output and growth in service and manufacturing sectors. More recently, economist Shahid Javed Burki said some of the methods that Pakistan was using and the surveys that collected required data were seriously outdated. Pakistan was also not correctly estimating the size of its modern services – in particular information, communications, entertainment, travel and advanced commerce. All these sectors contribute much more to the economy than suggested by official numbers, he wrote. The economic growth outlook for Pakistan is projected to trend up to 5.2 to 5.4 per cent in both 2017 and 2018, forecasts the latest Economic and Social Survey of Asia and the Pacific 2017. Private consumption and public investment would drive the economy, supported by higher consumer credits, improved security conditions and ongoing infrastructure projects under the China-Pakistan Economic Corridor (CPEC), says the survey which focused on ‘Governance and Fiscal Management’. Increased capital inflows from China to finance projects under CPEC have helped generate foreign exchange receipts, although imports of transport and construction-related items also increased, the survey by the United Nations Economic and Social Commission for Asia and the Pacific (UNESCAP) notes. The survey says that private investment was stronger in Pakistan as CPEC helped attract more foreign investment. On the supply side, the large-scale manufacturing sector should benefit from greater energy security and a notable cut in gas prices for industrial use. Similarly, the agricultural sector is likely to improve, with expanded production of cotton, sugarcane and maize, the survey notes. Meanwhile, a rebound in global oil prices and an upward adjustment in domestic petrol prices would push up inflation during the fiscal year 2017-18 from 5pc to 5.5pc, which is still within the official target of 6pc. Pakistan's economic lifeline is its remittances. A staggering $2billion from overseas Pakistanis per month on an average is a blessing in disguise for the cash-starved economy and has widely helped in balancing payments towards imports, especially oil. They have acted as a catalyst in growth and investments. Undisputedly, it is one of the primary sources of foreign exchange reserves for the country and for an economy, which is ridden with inflation and slump in exports, the annual subscription of more than $25 billion acts as its backbone. The good point is that despite somersaults on the global economic level and a nosedive, Pakistanis have stood fast in retaining their culture of remitting back home, and have widely entrusted the country's banks and other legal avenues for transfer of funds. Despite a wide gap in the dollar rates in open and banking markets, overseas Pakistanis preferred to send money mostly through the banking channel. This reflects their confidence in the government, as well as banks operating in Pakistan. The State Bank of Pakistan, in one of its recent reports, said that Pakistan has fared relatively better than other regional countries concerning foreign remittances. Estimates say an average of $1.7 to $1.9 billion is received on a monthly basis, which accounts for a staggering $22 billion per annum. Most of the remittances are from the Middle East and Gulf countries, especially Saudi Arabia, the UAE, and Oman. Payments from all important destinations, except Saudi Arabia, showed positive growth. Inflows from the kingdom declined 7.5 per cent during the last fiscal year to the tune of 5.5 per cent. Nonetheless, Pakistan received $2.5 billion from Saudi Arabia in the year 2017. The second highest inflow is from the United Arab Emirates, which increased 1.13 per cent to $2.2bn. A silent but sizeable chunk of remittances, although on a quarterly and six-monthly basis, are also registered from the United States, the European Union, South Africa and Australia. Many of the Far East Asian countries, especially Malaysia and Hong Kong, Korea and Japan also are potential remittances pockets. Remittances from the US have also seen an upward trend by around 10 per cent, to cross the barrier of one billion dollars per quarter. Similarly, inflows from the UK also recorded an increase of 23 per cent to $1.35 billion. This primarily acts as seed money for the country's balance of payments, and to a great extent compensates for lack of foreign investment and slowdown in portfolio investments. The pre-budget Economic Review, however, estimated that remittances could grow by 50 per cent if the government provides due incentives to its non-resident citizens, and ensures that their foreign exchange is safe and reusable in the same currency. Likewise, remittances directly deposited in Pakistani bank accounts can also get a boost and shoot up to $100 billion - a retained safe territory, if stringent measures are taken and assurances on withdrawals limits are waived. The free flow of foreign currency in the form of remittances can lift the economy to new heights. Pakistani foreign currency accounts maintained abroad are in billions of dollars, and a submission in the Senate of Pakistan said that they account for around $800 billion. That money sooner than later should be in the mainstream of Pakistan economy, provided anti-money laundering policies get thumbs up.